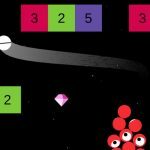 We have covered a couple of Ketchapp games in the last few days, including Pocket Pool and Jelly Run. Now, the casual gaming giant is back with the signature blend of minimalist graphics and addictive gameplay. 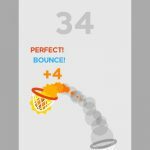 Falling Ballz is an action-packed time killer for Android and iOS devices. In this game, you are given white balls that you must throw at numbered shapes that are slowly moving towards the top of the screen. Each time a white ball hits the numbered shapes, the numbers go down by one. Your goal is to reduce these numbers to zero to make the shapes disappear. You will need to make the balls bounce around as much as you can in order to maximize the damage dealt by each ball. If the shapes reach the top before you can delete them, it’s game over. If you find yourself struggling to score some points, make sure you rely on our Falling Ballz tips, cheats and tricks for help! The first problem you will probably encounter in this game is figuring out what you need to do. The game does not provide any tutorial, so you will have to learn how to play through trial and error. The good news is that we are here to teach you, so you won’t have to guess on your own. 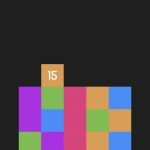 As we mentioned above, your goal is to stop the shapes from reaching the top of the screen. If you see a shape blinking, that means it is about to reach the threshold, and you will lose if you don’t take it out in your next turn. Always prioritize hitting the highest shape, regardless of its number. It only takes a single shape to take you out of the game so do not any of them for granted. The only time you can safely skip hitting a shape is if it only has one hit left and it isn’t blinking yet. On top of that, hitting the highest shape also gives you more chances of the ball bouncing off other shapes before it makes it way to the bottom of the screen. Even though you are supposed to target whatever the highest shape is, you should still try to aim in a way that the ball would hit other shapes before falling. Avoid aiming straight at the middle of a shape because the ball will just bounce directly back at you, and it will most likely end up falling. Try to aim at the edges of the shapes in order to maximize the ball’s bouncing potential. You may need to practice a few times since the physics in this game can be a bit tricky. Keep in mind that you don’t really have any control of the ball once it has been launched. That means there is no point in waiting for things to run through their normal course. Just hit the speed up button in order to finish each turn more quickly. This saves you time and you will be able to focus on your next shot. Of course, just because you should speed up the ball’s animation doesn’t mean you should also rush your shot. Take all the time you need to ensure your shots are perfectly aligned. If you end up losing, don’t lose hope right away. You can just watch a short video advertisement in order to continue where you left off. 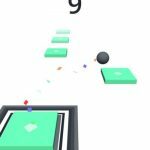 Bouncing balls around can be relaxing but it can also be very challenging, especially if you are aiming for high scores. Just follow our Falling Ballz tips and tricks and you’ll be raking in points in no time! If you have other tips or tricks to share, feel free to let us know in the comments below!